· Check your fire extinguishers. · Check for overloaded or damaged extension cords, replace where needed. · Ensure you have an emergency preparedness kit in case of incidents such as power outages and flooding. · Windows should be checked to ensure they open and close properly, in case they are needed as an exit. · Properly store household chemicals and never mix cleaning agents. · Recycle: Get rid of old newspapers, magazines and junk mail. These items tend to pile up and can greatly contribute to the severity and spread of fire. · Check and clean filters above stove. · Pull refrigerator out and vacuum or dust the coils. · Always keep stairs and landings clear for safe evacuation in event of an emergency. · Make sure your address numbers are up and visible from the street. · Maintain a clear 'fire zone' of 10 feet around structures. · Check outdoor electrical outlets and other electrical appliances for animal nests and to ensure proper wiring. · Keep 100' of garden hose with an attached nozzle connected and ready for use. · Remove leaves and trash from carports and garages: Combustible materials are dangerous if they are exposed to heated automobile components, especially under the vehicle. · Clean up and properly store paints, pool and yard chemicals. · Check fuels containers for leaks and make sure they are properly stored. · Let power equipment sit for approximately 30 minutes before placing it inside to be sure there is no possibility of fire. The Regional District of Central Kootenay has received a report from geotechnical engineers regarding the Zwicky Road, Kaslo Landslide. At this time the evacuation order for six homes below the slide remains in place. The RDCK will review the report and will accompany geotechnical engineers while they continue to assess the slide tomorrow and Saturday. The RDCK will keep the public updated as more information becomes available. Residents are reminded that therewill be a public meeting held in Kaslo on Monday April 24th at 6pm to update residents on the landslide. The meeting will be held at the Kaslo Royal Canadian Legion Hall, located at 403 5th Street in Kaslo. Residents can contact the Emergency Operations Centre Reception for more information at1-866-522-7701 or 250-352-7701. The long awaited Kaslo Search and Rescue boat has arrived! Launched Dec 10, at Kaslo Bay Park with much appreciation and thanks for the KSAR team and to all the sponsors and funders who helped bring this valuable resource to our area. Kaslo Search and Rescue team with new SAR boat. 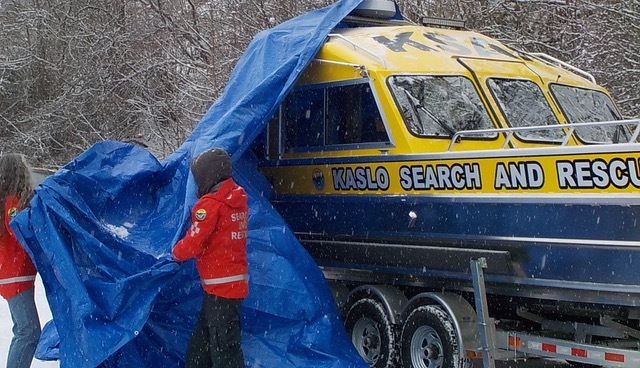 Please join the Kaslo Search and Rescue team on Saturday December 10, 2016 at Kaslo Bay Park to welcome the new KSAR boat. Refreshments and a welcoming , and possibly boat rides too.... from 11-3 . See you there! Category 2 open fires will once again be permitted in the Columbia, Arrow and Kootenay Lake fire zones of the Southeast Fire Centre, due to a decreased risk of wildfire in those areas. Category 3 open fires are still prohibited throughout the Southeast Fire Centre. binary targets and sky lanterns. embers to other combustible material and start new fires. 􀂇 Never leave a fire unattended. you leave the area for any length of time. In British Columbia, the Wildfire Act specifies a person􀍛s legal obligations when using open fire on or within one kilometre of forest land or grassland. 􀍞poor􀍟􀀃or 􀍞fair􀍟􀍕􀀃open burning is restricted.